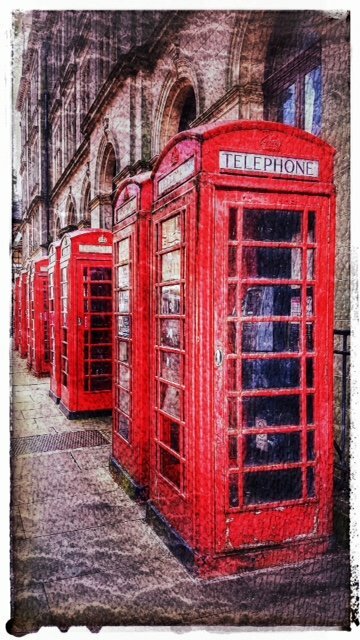 Neat line of phone boxes... bounds like Preston was the place to be as have just seen @happypat photo today..
Oh wow yes have you been in Preston too Lynda? We must surely arrange a meet up one day! I might have passed you & not known it! I was in from 11am until around 2.15pm. The telephone boxes! A real blast from the past. They look like sentries on duty. Very cool shot and vintage processing! so neat to think both you and Pat were in Preston at the same time. @happypat oh Pat, you probably walked past me - I was sat around for an hour waiting for hubby who had taken his dad to dentist but took longer than anticipated!! Gave me chance to take some pics though 😊 And yes, we should meet! @farmreporter thank you, and yes if I had known Pat was there we could have had coffee!